Whether out of curiosity or enjoyment, many people like to try roller coaster simulators. Nothing can completely mimic the feeling in the pit of your stomach as you go down that first giant drop, but a virtual reality roller coaster is still fun to try. How Does a Roller Coaster Simulator Work? Essentially, a roller coaster simulator pairs motion with visual and auditory stimuli to create the feeling of being on an actual roller coaster. It does not completely recreate that free fall feeling, but it will jolt, twist and turn you for an exciting experience. Sometimes, you can actually design your ride, choosing from various templates and scenarios to create a truly unique experience. You can also check local party supply stores. However, you will get a better quality simulator, if you go through a company that specializes in just acquiring virtual reality technology. While most people would not be interested in visiting a simulator in lieu of the real thing, there are a few roller coaster simulators that might be worth your time to check out if you are in the neighborhood. Batman: The Ride 2 is the name of one of the roller coasters at many Six Flags theme parks. However, it is also the name of a simulated roller coaster at the Warner Brothers Movie World in the Gold Coast in Australia. The ride takes you through the Wayne mansion, into the Batcave and through the dangerous streets of Gotham City. The Sum of All Thrills is one of the newer additions to Innoventions in Disney's Epcot theme park. Kids can design their very own roller coaster, complete with spiral dives, loop to loops, and stomach dropping turns. 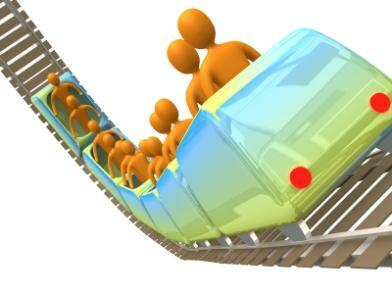 Then, they climb aboard a 4-D simulator car and ride their own roller coaster. It is important to realize that although a virtual reality coaster does not offer the same gravity defying thrills as does a regular roller coaster. People with heart conditions, women who are pregnant, and those with back problems should not ride. In addition, most motion simulation rides have height requirements. However, in many cases, there is a motionless option that allows those who cannot otherwise ride to still participate in at least of the thrills. While virtual reality roller coasters are not exactly like a real roller coaster, they are an interesting and engaging diversion. They can be quite exciting, especially if you get to design your own. You may find that you really enjoy riding them.